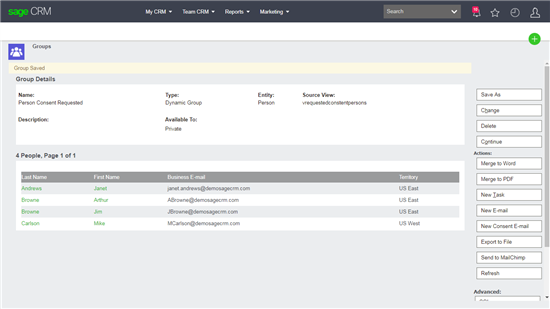 Sage CRM 2018 R3: How to create a group that includes all those Persons who have not yet responded to a consent request. Sage CRM 2018 R2 added new views that could be used to create groups that only include Persons and Lead who have explicitly granted consent. For example, if I wanted to I could create a Dynamic Group based on the person entity and use the 'Consented Persons' view. These views gather a list of persons or leads who have actually responded giving consent. The key clause within the view is CMgt_Status = 'Consented'. If we now want to look for look for Persons who have been sent a request but have not yet responded then we can look for when the CMgt_Status field is 'Requested'. And we can create a new View to make this available for Groups and Reports. Which is allows us to create our own new Group using the view. To list all those Persons who have been contacted but have not yet responded.